few people outside of the western coastal regions of southern India would have heard of kokum. Perhaps visitors to the sunny beaches of Goa remember being served a large glass of a refreshing, tangy drink after a heavy meal. Meant to be an aid to the digestive process, this delicious sorbet is prepared from the fruit of the kokum tree (Garcinia indica), and has been used by locals as a cooling ingredient for centuries. Of late, there has been resurgence of interest in the medicinal properties of kokum. This has led to a huge boom in the demand for kokum extracts in the international market. What exactly is this kokum? The kokum tree is a very localised, tropical evergreen species, confined only to the western coastal regions of India stretching from Kerala to Gujarat. A fully-grown tree could reach a height of 50 feet. Its round fruits are darkish purple, about an inch-and-a-half in diameter, with 7 or 8 seeds. When ripe, they are picked. Their rinds are soaked in the fruit pulp and then dried, much like tamarind. 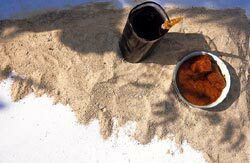 This dried rind, called solam, is then ground and used as a condiment to give curries, chutneys and sauces a spicy sour flavour and dark colour. Often, when used in curries, the dried skin is not even ground - thin whole strips are used instead. Even kokum seeds are of value. They contain a fat that is made into kokum butter, otherwise known as Goa butter, which is a healthy alternative to cocoa butter, milk-based butter or ghee (clarified butter). Kokum's cooling properties are well-known. The fruit is rich in calcium, potassium and vitamin c. The fruits are soaked in sugar syrup to make amrit kokum, a refreshing drink often used to treat sunstroke. The kokum has numerous medicinal values as well. It is prescribed for heart ailments, stomach disorders, diabetes, tumours, and to fight cholesterol. Kokum butter can be used to treat backaches and muscle pulls. Both kokum and kokum butter, when applied, are also good for skin ailments, burns and rashes. In what may come as a heaven-sent solution for weight-watchers, it has recently been discovered that hydro citric acid, found in a calcium salt extract obtained from the fruit rind, can also help in reducing weight. This could potentially be a goldmine for the health food market. Demand for kokum extracts are rising steadily, both in India and abroad. The kokum tree, which the ancient Indian texts on ayurveda call the vriksamala, could once again return to its place of glory.